After a long winter, we’re looking forward to summer activities like gardening, swimming and biking. But kids from Telluride, Colorado have a different activity on their minds—sledding! Using an Elks National Foundation Gratitude Grant, Telluride, Colo., Lodge No. 692 partnered with the local organization One To One to hold a cardboard sled derby. One To One helps keep at-risk youth on the right path by pairing them with adult mentors. Each year, they hold the cardboard sled derby to teach kids about creativity, critical thinking and good sportsmanship. This year, the Elks were there to share their support. 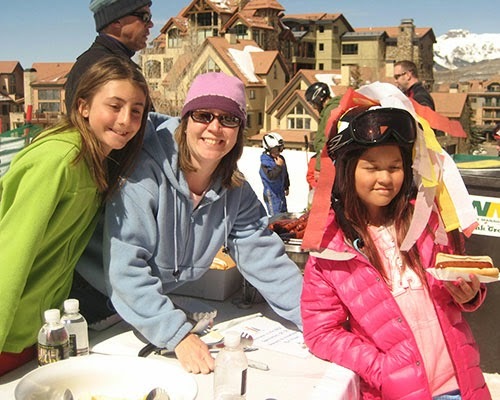 After cheering on the contestants, Elks prepared and served a barbeque lunch to the sledders and their families. Did your Lodge meet the National President’s per-member-giving goal in 2013-14? Then you are eligible to apply for a CIP Gratitude Grant! Don’t miss the opportunity to serve your community with this $2,000 grant. Gratitude Grant applications are due online by May 31. Click here for more information and to access to the online application. Thanks ENF! We couldn't have done it without you! Thanks for helping Telluride grow into a stronger community!